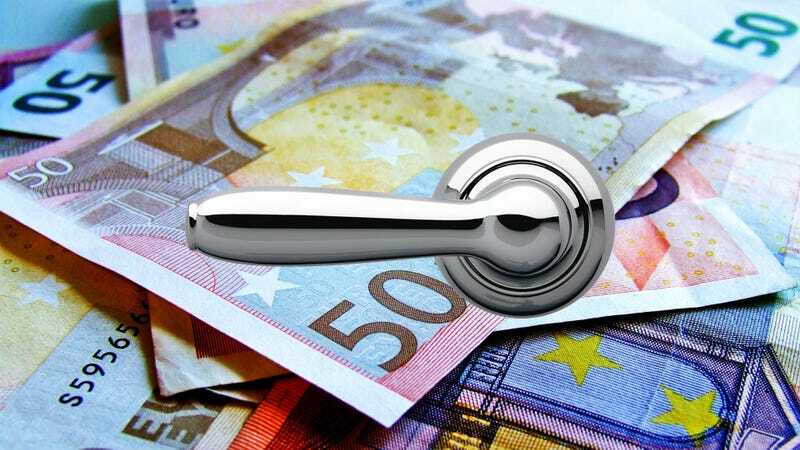 Why Is Someone Clogging Swiss Toilets With Tens of Thousands of Euros in Cash? Swiss authorities are trying to crack a strange case involving the disposal of more than $100,000 worth of 500-euro notes that were flushed down the toilets of public establishments in Geneva. The perfectly good cash caused thousands of dollars worth of plumbing damage and officials are stumped by the seemingly pointless destruction. Swiss outlet Tribune de Genève first reported on the case late last week, and the story has since spread around the globe. According to Bloomberg, the first stash of 500-euro bills (each worth about $597) was found stuffed into a toilet located near a safe deposit box vault at a branch of Swiss bank UBS. The bills were reportedly cut up with scissors. This obviously raised a lot questions at the time, but the strange incident may have been dismissed as a fluke if it weren’t for further discoveries. Soon afterward, an employee at the nearby Pizzeria du Molard reportedly called police to complain that their toilet was clogged with cash. Ultimately, more bills were found in the toilets of three different restaurants close to the UBS branch, with a total of $119,000 in cash chopped up and flushed down the drain. In the US, it’s illegal to destroy our money, but that’s not the case in Switzerland. Even if it were, the Swiss franc is the country’s official currency, not the euro. Still, police are as curious as we are about what the hell is going on here and UBS has declined to comment publicly. Henri Della Casa, a spokesman for the Geneva Prosecutor’s Office, tells Bloomberg that “there must be something behind this story,” and “that’s why we started an investigation.” Of course, there might be some sort of ordinance against going around damaging people’s plumbing, but systematically ditching a hundred grand in cash is a lot more intriguing. The case recently took an even more bizarre turn when a man claiming to be the attorney for two Spanish women arrived at a Geneva police station offering payment for the damages. The Tribune de Genève reports that investigators had identified the women as suspects after reviewing surveillance footage. If the lawyer explained to the police why the cash was flushed in the first place, the authorities aren’t sharing that information with the press. One possible clue is that the European Central Bank moved to ban the production of 500-euro notes last year due to its use in money laundering. According to The New York Times, “in some circles, criminals refer to the note as a ‘Bin Laden,’ after the former leader of Al Qaeda.” But the bill is still a legal tender. Personally, we’re putting our money on it being Banksy trying to make a statement about capitalism and Brexit.